“Ode to the Goose” by Korean-Chinese director Zhang Lu is a curious film. The main characters go through numerous conflicts in their lives, many of which remain unresolved. “I do not know the answers (to the conflicts). 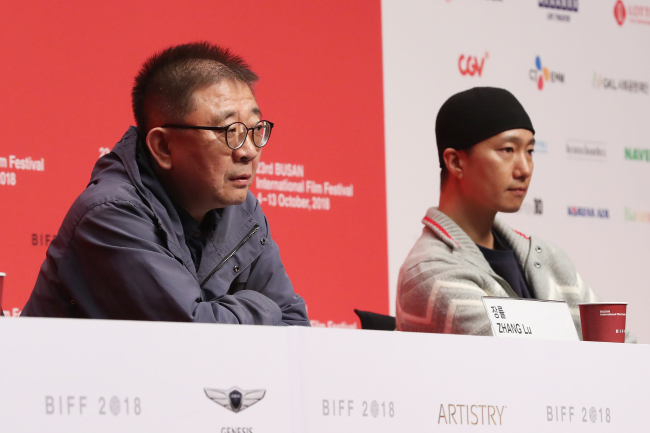 A director’s job is to find (things) to be curious about in life,” he said at a press conference for his film, screened at the Busan International Film Festival on Friday. True to his words, the director refused to spell out what his film was about, leaving the audience to interpret the story on their own. The film starts with a trip to Gunsan, North Jeolla Province, by two friends. Yun-yeong and Song-hyun, played by Park Hae-il and Moon So-ri, stay at a bed-and-breakfast establishment run by a middle-aged man (Jung Jin-young) and his autistic daughter (Park So-dam). The relationships between the four are complicated, as they each struggle to communicate. The middle-aged man is still grieving the death of his wife years ago, while the divorced Song-hyun is scared of letting another man hurt her. Yun-yeong is “ambiguous,” in Song-hyun’s words, and the daughter’s disability hinders straightforward communication. Yet she is paradoxically the only one in the film who actively tries to communicate with Yun-yeong. “People with autism yearn for communication more than anyone, yet their route to (communication) is blocked. Yun-yeong has comforted her in a way by communicating with her,” said the director. While the girl cannot talk, Yun-yeong is fluent in Korean and Chinese. Yet his attempts to communicate with others continue to fail throughout the movie. His words and his presence fail to leave lasting impressions on other people, and his futile attempts to connect echo back to him. Yun-yeong’s vain attempts to connect with Song-hyun -- with whom he has been in love for a long time -- are made more poignant by a backward sequence of events in the third act, when the film focuses almost solely on him. In showing his viewpoint, the scenes proceed in reverse. Another aspect of the film that stands out is the presence of Korean-Chinese, who are considered foreigners in Korea and often face discrimination. Song-hyun casually mentions that her grandfather used to live in Manchuria, and that she too would be a Korean-Chinese if he hadn’t decided to migrate here. This may be to show that things are not always as black and white as they appear to be. Or they may be just minor details that the Korean-Chinese director chose to put in his film. There is an abundance of details in the film that can be interpreted in a number of ways, which will make the flick feel different to each viewer. “Ode to the Goose” is one of three films featured at BIFF’s Gala Presentation, along with “First Night Nerves” by Stanley Kwan and “Killing” by Tsukamoto Shinya of Japan. The 23rd BIFF will run until Oct. 13 across Busan at the Busan Cinema Center, Lotte Cinema Centum City, CGV Centum City, Megabox Haeundae and Dongseo University’s Sohyang Theater.